A supreme example of modernism (and its founding text for that matter) is T.S. Eliot’s The Waste Land. The Waste Land shows how imagism transitioned into modernism and created a portrait of a failed modern society. 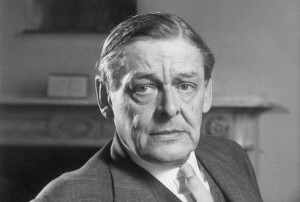 Eliot considered his contemporary society to be hypocritical and to have moved so far away from its spiritual and cultural roots as to have lost all moral value. The poem is full of broken, disjointed and otherwise unrelated slices of imagery that come together to form a disjunctive anti-narrative. The motif of sight and vision is as central to the poem as it is to modernism; the omnipresent character Tiresias acting as a unifying theme (Tiresias was a blind prophet of Greek mythology). The reader is thrown into uncertainty, unable to see anything but a heap of ruined images. The narrator, however, promises to show the reader a different meaning; that is, how to make sense out of dislocation and fragmentation. This construction of an exclusive meaning is vital to modernism. The poem shifts between satire and prophecy, and is dedicated to his fellow poet, friend and masterful editor, Ezra Pound. The tone reflects the experiences of a man who lived through World War I. It is best summarized in the poem itself, and in part of the dedication to Ezra Pound, “For once I saw with my own eyes the Cumean Sibyl hanging in a jar, and when the boys asked her, ‘Sibyl, what do you want?’ she answered, ‘I want to die.’” (a Latin and Greek epigraph from The Satyricon of Petronius). The poem ends with “Shantih shantih shantih,” a Sanskrit mantra. Interestingly enough, Eliot had studied Indian philosophy and Sanskrit at Harvard University about ten years prior to publishing this poem. The poem has many speakers of undefined quantity, each making seemingly true but conflicting statements. This creates a paradox of sorts. This is a modernist theme along the lines of this: Each individual has a unique identity, yet they are able to connect to each other, albeit only temporarily. However, as seen in events such as the Great War, human society is often extremely defective. The title itself, The Waste Land, (although originally titled He do the Policemen in Different Voices which is a reference to a Dickens novel) is a metaphor for the worth of modern culture. “The Burial of the Dead” serves as the title of Eliot’s first section and is an allusion to the Book of Common Prayer, the prayer book of the Church of England — and several other biblical allusions. The second section of “The Burial of the Dead” shifts from the voice of the powerless Marie and becomes the voice of the narrator. The first twelve lines of this section include three Old Testament allusions, and the narrator finds himself in a summer drought that has transformed the land into a desert. He is referred to as the “Son of man,” a title common in the Hebrew Bible, sometimes applied to denote any man — i.e. son of man = human — but sometimes also used to single out a specific man, for example Ezekiel, who was called upon by God to warn Israel to repent of their idolatry. It is also a title used in the New Testament, notably by Jesus when referring to himself, speaking of his coming death and apocalyptic return, or when making prophetic predictions of judgment to come (e.g. Gospel of Mark 10:32-34, Gospel of Matthew 20:17-19; Gospel of Luke 18:31-34 and Mark 8:38-9:1, Matthew 16:27-28, Luke 9:26-27, etc.). In Ezekiel, God finally tells the prophet that Israel will not change; therefore, their altars will be desolate, images broken, and their cities will lay in waste. In the book of Ecclesiastes, God warns the Jewish people that they should remember the days of their youth, for in their old age “fears shall be in the way” and “then shall the dust return to the earth as it was” (Authorized King James Version, Ezekiel 6:4, Ecclesiastes 12:5-7). One critic, Gish, analyzes these allusions by writing, “Dead land, broken images, fear and dust, all take on the significance of human failure” (50). After such a depressing sequence of events, the narrator is offered shelter under a mysterious “red rock” which is an allusion to Isaiah’s reference to the coming Messiah who will be “as rivers of water in a dry place, as the shadow of a great rock in a weary land” (Isaiah 32:2).